Word of the Month: November – The Japan-America Society of Washington, Inc.
“Shinkansen” 新幹線, known in English as the “bullet train,” are high-speed railway trains in Japan operated by six Japan Railways Group companies: JR-Hokkaido, JR-East, JR-Central, JR-West, JR-Shikoku, and JR-Kyushu. 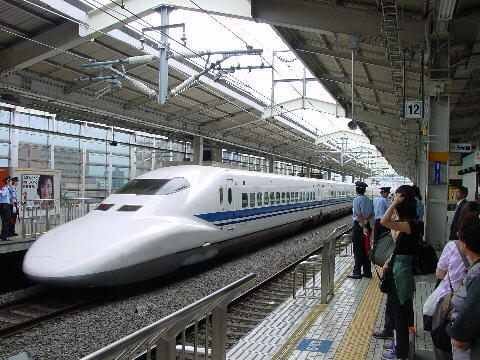 The maximum operating speed of shinkansen is 200 mph (320 km/h), so they are perfect for traveling long distances in Japan in a short period of time. Japan’s Shinkansen network has one of the highest annual passenger ridership numbers, with a maximum of 353 million people per year. The holiday season is just around the corner, and if you plan on spending your vacation or time off in Japan, then you should consider purchasing a JR rail pass at a significantly reduced price. All you need to purchase one (as a US permanent resident) is your passport, to show your “temporary visitor” stamp, and your driver’s license. Click here for more information about reserving a pass and pricing. It is also important to take note of some of these upcoming, Japanese national holidays – as they will definitely hinder your travel by shinkansen on their respective dates. They are Culture Day (November 3), Labor Thanksgiving Day (November 23), and the Emperor’s Birthday (December 23). “Useful tips for traveling in Japan.” JAPAN RAIL PASS, www.japanrailpass.net/en/useful.html.